Culms: Erect or ascending, solid, often branching below, grooved on 1 side; often short, nodes with flattened hairs. Blades: Flat or folded, 1 to 10 inches long, to 1/4 inch wide, waxy, glabrous or thinly hairy at collar, midrib prominent; margins brownish to whitish; tips taper to points. Sheaths: Shorter than internodes, smooth, slightly keeled near collar. Ligules: Membranous, margins notched to entire. Inflorescences: Panicles, 2.5 to 6 inches long, broader near middle or base, plume-like, silky, silvery-white; branches 6 or more, each 1 to 1.5 inch long. Spikelets: Paired, lower spikelet sessile and perfect, upper spikelet stalked and sterile; first glume silky hairy at base; fertile lemmas with awns 1/2 to 3/4 inch long, bent. 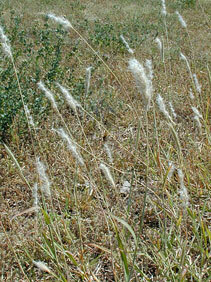 Habitat: Dry prairies, roadsides, waste areas, and rocky slopes, particularly on sandy and limestone sites. Forage Value: Fair for livestock and wildlife but is usually only grazed when young. Uses: The Kiowa used the stems for toothpicks. Comments: Tufted. Silver bluestem spreads quickly in disturbed or overgrazed areas.